It is well established over the decades how important it is to stay on top of things occurring around you. And with the Android revolution the meaning of this has been extended so intensely that it’s seemingly impossible for any Android user to not know what happens around them. In fact, what has happened is the widely known as the phenomenon of information overload and as a consequence of that what we have are applications swarming the Android space to substantiate their standing as key disseminators of vital information. The conquest has taken to the streets but that has only worked in the favour of us Android users as we have literally what foodies would call a ‘scrumptious buffet’ of news apps displayed oh so subliminally that outing them down without a read is almost impossible. In the light of all of this comes Zite, derived from Zeitgeist – the spirit of age and time, an RSS reader that may not supersede the giants where the interface is concerned but definitely poses a challenge to the frontrunners in making their job a tad bit difficult. On downloading the free app and launching it the first thing it asks you is to sync with your Twitter or Google reader, but considering the latter has phased out, the former serves as an ideal entry tool. So the list is huge and provides for great customization. Once you choose one of these and hit the done button, the simplistic interface in white loads instantaneously and redirects you to the top stories tab. You can see the category at the top and scroll and swipe the screen to switch between categories. The news and reviews are displayed categorically and from the most recent moving downwards. 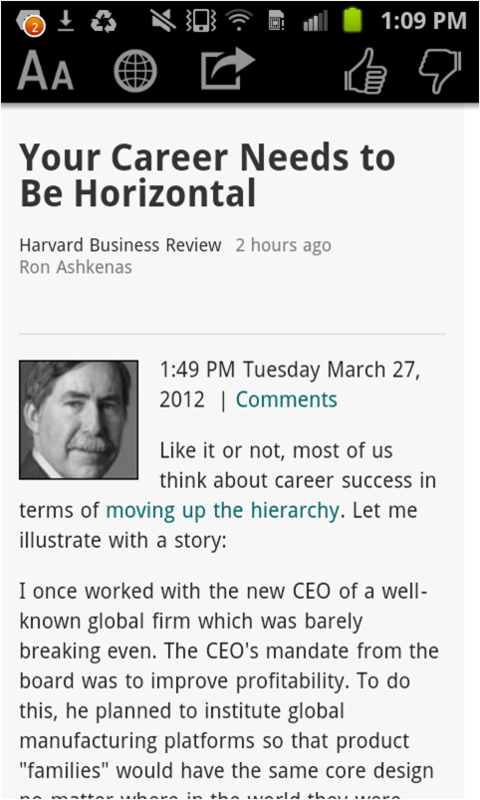 Each post is accompanied by a high definition graphic/image that tells you more about the article. 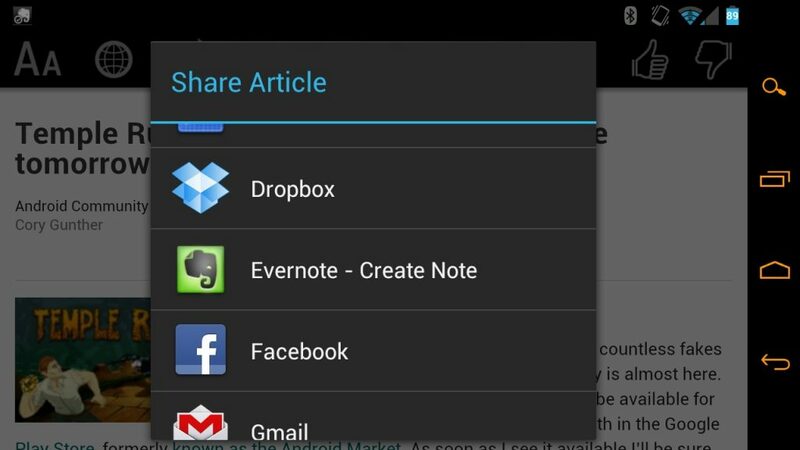 Attached hyperlinks take keep you intertwined within the app. You can give each article a thumbs up or down depending on whether you like it or not. 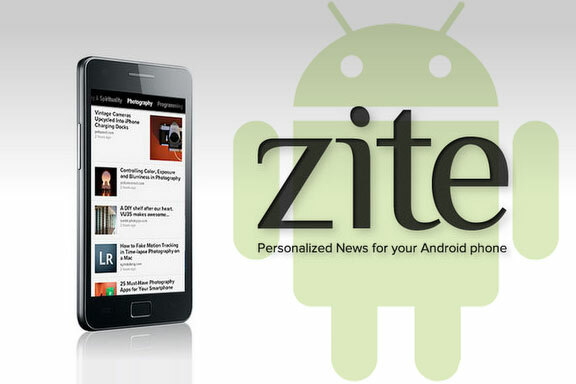 Further share it on as many platforms like your email, Gmail, Facebook, Google account and all the other integrated readers on to your device that Zite detects. You can enjoy cloud services as Zite can be used across multiple platforms and all you need to do is log in for your preferences as you like to read. Change the font size through a button at the top left and be directed to the main site as well where the actual article originated. 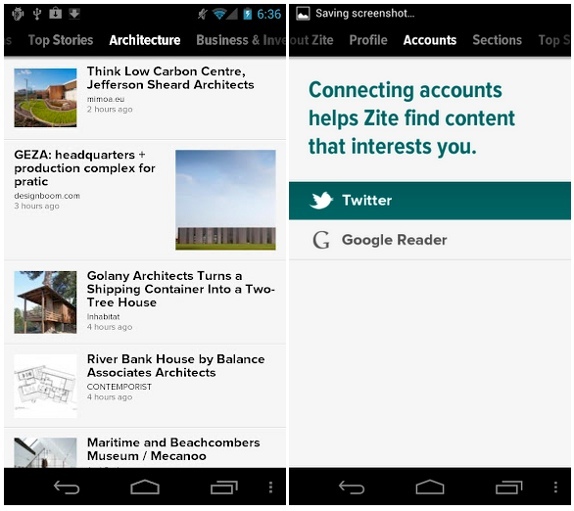 All in all Zite is an assertive attempt in a market filled with readers but its fair popularity makes it a contender, may be not a strong one but definitely a one to consider for your Android device.